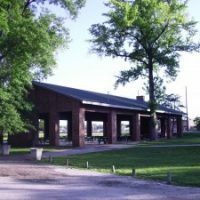 The Vincennes Board of Works has approved a change order for the Vincennes Parks Department’s work on the Gregg Park Shelterhouse. The enclosed structure was built in the late 1930’s as a federal W-P-A project. One of the change orders was for just over 13-thousand, 750 dollars for extra paint removal. The other order was for 27-hundred more dollars for changing tables. As a precaution, the approved motion extended the finishing date timeline to June seventh. The motion was approved unanimously.